There's a big news story today that no one is covering. The story is that much of the world is living in poverty. There are about 6.7 billion people in the world. About half of those people live on less than $2.50/day. 26,500-30,000 children die each day due to poverty (source). You think school shootings are bad? Try annihilating two or three average-sized elementary schools—every hour. 1 in 6 people in the world are illiterate (source). 1.1 billion people have inadequate access to water. If you're reading this post, chances are that you're not part of the population that we're talking about. The fact that you have electricity and internet access bumps you out of that group. However, that means that you probably also have a lot of capacity to help. Christ taught that "unto whomsoever much is given, of him shall be much required". This principle certainly applies to both you and me as individuals, as well as the countries where we live. We have a lot to do as a world. People and countries that are well off (that's you!) have a responsibility to help those who are struggling. The way that we help is important, because some help actually hurts. For example, food aid can actually cause more problems than it solves, since it can depress prices below what local farmers can compete with. (Agricultural subsidies in developed nations have the same effect.) The result is that instead of having local farmers supply nutritional needs and build the local economy, the farmers are themselves forced into poverty and their country becomes even more dependent on foreign aid. Real solutions must be sustainable. As part of Poverty Day today, the U.N. released a book called Turning Rhetoric into Action. Its motto, "With us not for us", is a good summary of how to make real progress. Reduce barriers to trade for poor countries. Providing a broader market for poor people to sell their wares would cost us little and help them a lot. Get rid of farm subsidies. Artificially pricing one of the most viable economic activities in developing nations out of the game just isn't cool. Help people in developing nations learn how to lift themselves out of poverty. We can't just do it for them, or else things will return to how they were when we leave. People and nations need to become self-sufficient. Relieve debt for poor countries. This would free up resources spent financing debt for more productive uses. "OK," you might say, "but what can I do? I can't just eliminate tariffs by myself or forgive Madagascar's debt." True. 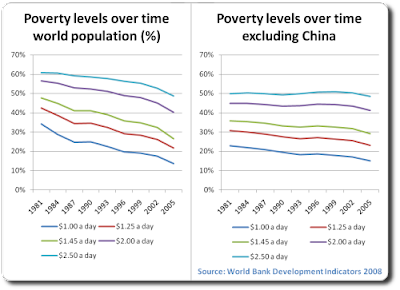 Fighting poverty requires big changes that no one can effect alone. However, you can still help. Spread the word. If everyone knew and cared about this issue, things would change. Contribute to organizations that promote sustainable solutions to world problems. Influence the legislative process to promote helpful policies and laws. Pray for change—and then do something. wow. I remember when i was in high school hearing statistics that basically said that we (those of us reading it) were most-likely among the richest people in the world. I remember that had an effect on me then. I haven't really thought about that in awhile. It is so easy to get caught up in our own lives. A hard time for us is when we can't afford to by that toy or do that thing we've been wanting to do. It is so easy to forget about the millions of people who literally have nothing. Good post.